Novels are tricky. There’s so much to juggle that no-one gets it quite right the first time round … and most authors end up doing wholesale rewrites, rather than just making a few editorial tweaks. I’ve come to accept that rewriting is just part of the process of creating a novel. Each time I start work on a new book, I want to be a more efficient writer – and while I have found some things easier, I still end up doing a lot of rewriting and reworking. Maybe it’s the same way for you. 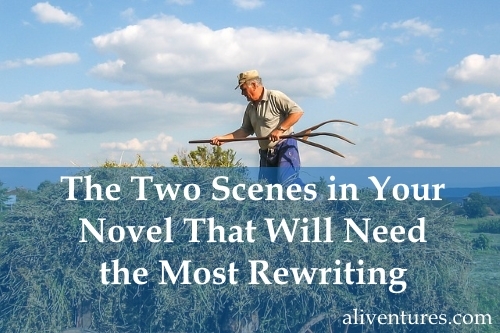 However hard you worked in the first draft, and however much you planned, these are just really difficult scenes to pull off well. Note: This post was first published in 2011, and updated in July 2018. Do you struggle to focus when you’re writing, or do you find yourself starting and stopping a lot? 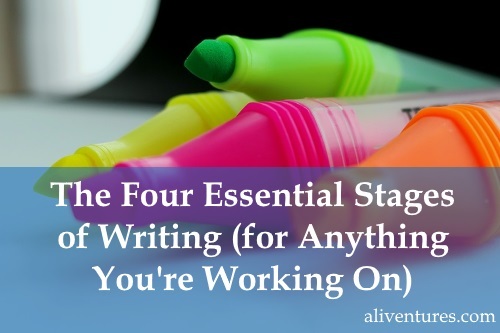 It might be because you’re skipping certain stages of the writing process without even realising. In my post, 7 Habits of Serious Writers, I cover the importance of actually writing, plus the need to redraft. But writing and redrafting aren’t the only stages you need to go through to produce an effective piece of writing. Sure, you could potentially publish a blog post without doing any planning, or any rewriting and editing. Unless you’re very lucky, though (or writing something extremely short), you’ll be lacking a clear focus, the structure won’t quite work, and there’ll be clumsy sentences all over the place. It wouldn’t really be a finished piece. It would be a draft. But it’s crucial to be clear about what each stage involves. If you’re struggling with a particular piece of writing, there’s a good chance that you’ve skipped a step somewhere – or that you’ve tried to do everything at once. The Aliventures newsletter includes a short article on writing, and comes to your inbox every week. Pop your email address in here and you'll also get instant access to free ebooks. I’m Ali Luke, and I live in Leeds in the UK with my husband and two children. Aliventures is where I help you master the art, craft and business of writing. My contemporary fantasy trilogy is available from Amazon. The books follow on from one another, so read Lycopolis before the others. You can buy or sample them on your local Amazon, or read all three FREE in Kindle Unlimited. The Aliventures newsletter comes straight to your inbox each Thursday, with an article about an aspect of writing, plus a short review of what I’ve been reading that week. When you join, you get a 35% discount on all my self-study materials (Blogger’s Guides and seminar packs), plus access to a free library of mini-ebooks.